You are here: Home / Life / Los Angeles and E3, Here I Come! I’m sitting at my mom’s in Arkansas right now getting ready for Family Reunion; I packed this morning. On Monday, I’ll be sitting on a plane headed to Los Angeles; I bet I pack that morning. Remember me talking about that contest Kmart was running? That one that where they’re taking three bloggers to Los Angeles to attend E3 and I won a spot? To say I’m a tad nervous is probably the biggest understatement I’ve made this year. Yeah. Nervous. There are going to be tons of exibitors at the show–head to the exhibitors’ list to get an idea of the number of companies I’m talking about. Pages and pages of companies. I didn’t count them but feel free to if you get bored. Tuesday through Thursday is going to be packed with meetings with a lot of those meetings being special things Kmart has set up so we get more hands-on time than most of the folks who will be in attendance. There’s also going to be an interview session where they video tape us talking about what we’re excited about seeing and answering a bunch of questions about gaming and such. There’s a chance I might be more nervous about that than E3 itself. Cross your fingers they have a hair and makeup person. I’m joking…not really. You know I’ve been to a couple of conferences in the past but I don’t think there’s anything that can prepare me for E3 other than just experiencing the actual beast. Nervous and excited and a bit pukey over here in Arkansas. I’m going to get as many pictures as my Captivate can hold and see as many new games as my brain can stand. Let me know what you’re dying to see and learn about cause I’m making my list, folks. 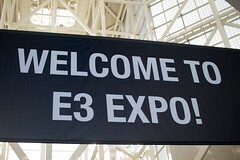 As a part of my participation at E3 2011 on behalf of KmartGamer, Sears Holdings provided my travel and accommodations and this is going to rock. Though I’m nervous like a mug, I can’t wait! Skyrim…any info you bring back about it will be much appreciated and devoured. I really hope to hear your view on the NGP and the new uncharted they are releasing for it. I have played the uncharted games more than any other (yes even Call of Duty) and the idea that there will be 2 new games of uncharted this year has me rethinking my school schedule. Have a great time and relax, you are a pro and there is a reason so many people listen to and trust your opinion on games. Sounds like you are going to have a good time. My DS(15) is so jealous of you getting to go to E3. Have a blast! Stop it. You’re going to have fun.